Monday - Back to work, but I think I was ready to go back and get into a routine again. Thankfully, my work hadn't piled up too much whilst I was off. In hindsight I did make a mistake on Monday by going out for my lunch when I did, as the drizzle I left in turned into heavy rain and I didn't have a waterproof jacket with me, this left me soaking! There was a better end to the day as I finished earlier than normal so I could spend sometime with my little boy and look for my football boots for five-a-side (which I found just in time). I really enjoyed the game, I got amongst the goals and even saved a penalty, the only downsides were that I got clattered scoring my first goal and I ended up running in to a wall, leaving me a bit groggy. When I got home, I had chance to catch-up on the internet whilst my partner watched her YouTube channels. Tuesday - Monday night was not a good night, coupled with aching after 3 weeks of not playing football, my little boy seemed to wake up on the hour every hour from midnight. Thankfully the day that followed didn't continue this theme. Although I had a bit of work I needed to complete when I got home, I was able to enjoy some time with my son. Bedtime was a bit of a chore, as for the first time our son kept getting out of bed and coming to hid bedroom door. He knew he was doing something wrong, as when I appeared he ran straight back to bed. This interrupted time with my partner as we watched YouTube together. In hindsight I also think it was a mistake for him to have some shortbread he made in nursery just before going to bed. As I lay in bed, settling down for the night I started watching 'Dawn French: 30 Million Minutes'. It's turning out to be a very interesting programme and not just the stand-up show I was expecting - it's more like a humorous monologue, than joke and after joke, it's great so far watch it if you get chance. Wednesday - Apart from having to run for a train home, I didn't do a great deal on Wednesday evening, mainly down to my son deciding he's wasn't going to sleep. Nearly 2 hours after he went to bed, he finally fell asleep. When he finally started sleeping we watched the latest episode of 'Sherlock' (The Lying Detective), and what an episode it was! I'm a big fan of Toby Jones, so I was hopeful that it would be good, but it was fantastic all round, except one questionable deduction about "One word". Thursday - Not the start to the day I was wanting, upon arriving downstairs I found that our cat had been ill and I had to clear it up. A better start to the evening however as I loaded the dishwasher whilst cooking my sons tea, then I was able to start watching 'The Simpsons Movie' (2007). Our son still took some time to get to sleep, but it was nowhere near as painful as Wednesday, which allowed us to watch the final 'Jonathan Creek' episode and catch-up on a number of YouTube videos. 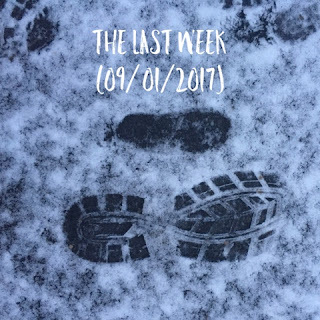 Friday - The first snow of the year fell, and its the first snow out son has encountered. On both accounts, it was a bit underwhelming. Barely a quarter of an inch of snow fell and our son barely noticed it all around him. I did capture a photo of his first footprint however for posterity. The evening saw us spending some time with my parents before heading home to watch some YouTube. When we went to bed I started to watch 'Batman Vs Superman: Dawn Of Justice' (2016) before falling asleep. Saturday - An early start to the morning with my son stirring at 05:50, disturbing me and I wasn't able to get back to sleep. As the morning continued, we played with my sons puzzles and watched TV. The afternoon saw a return to Greenhous Meadow to see Shrewsbury take on Bradford City resulting in a 1-0 victory. It was an entertaining game and although Bradford had plenty of the ball and probably the majority of territory, Shrewsbury seemed to be keeping the opposition at arms length and hitting them on the break. We then spent the evening watching YouTube. Sunday - We started the day by travelling to Telford to join in and celebrate the new year at a Disney Junior Party, I'm not sure if we went for our son or my partner! You can read all about the event here. When it finished, we popped to the town centre to see what we were missing. Other than a bath bomb from Lush and some other home-ware from Primark, we left with nothing. I think we're both a bit uninspired when it comes to shopping. After having a Greggs for lunch we headed to a birthday party for the daughter of a friend of my partner. It was then time to head home (via my parents) to get our little boy to bed. Once settled, we sat down in readiness for the final episode of 'Sherlock'. - what an episode. I fear that this may be the last episode, I hope not, but what a way to end the present series. To settle down before bed, I watched the latest episode of 'QI XL'.